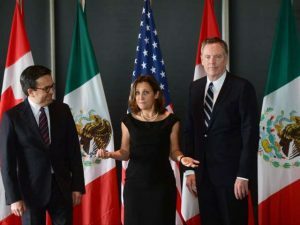 On Wednesday, three sources familiar with the ongoing NAFTA talks said that Mexico could leave the negotiating table if United States President Donald Trump makes a decision to trigger a process of six months to withdraw from the free trade pact. Canada was becoming more and more convinced that Trump would soon be making an announcement that the U.S. intends to exit the North American Free Trade Agreement or NAFTA. That news helped to send the currencies for both Canada and Mexico lower and hurt stocks across the entire continent. It is indisputable that if the U.S. president announces a withdrawal of his nation from NAFTA, at that same moment the negotiations will end, said Mexico’s head of international trade for the agriculture ministry Raul Urteaga. Two other sources, both of whom are involved with the trade talks but requested to remain anonymous, said Mexico is firm on its current position to leave the negotiating table if the U.S. president follows through with the move. Although a termination letter for NAFTA would begin the ticking of an exit clock of six months, the U.S. would not be bound legally to quit NAFTA when it expired. Washington might use the move as a sleight of hand when seeking to gain some leverage over Mexico and Canada in the negotiations to update the trade pact that has been in existence for 24 years. Trump for years has called the treaty bad and says it hurt workers in the U.S. His team of negotiators has set proposals that alarmed their counterparts from Mexico and Canada. Amongst the most divisive proposals are the plans to have rules of origin for goods where minimum levels would be set for U.S. content for autos, a clause that would end the trade pact if not renegotiated each five years, and ending the Chapter 19 mechanism for disputes. Though observers in Mexico and Canada are more and more gloomy over the upcoming January 23-28 round of talks in Montreal some are more positive following a speech Trump made to farmers earlier this week where he did not make provocative comments related to the trade pact. Urteaga, who participated as a member of the original Mexican negotiating teams for NAFTA during the 1990s, says that the speech by Trump was an interesting sign.